Part of the fun of having a camera on your cell phone is the ability to snap random and fun pictures anywhere that you go and post them on the fly. What is even more fun than that is having the ability to edit them and make them a bit different than they appear in real life before sharing them with friends and family. Not everyone has the time to sit down at a computer and edit the pictures that they took that day, nor do we always want to have to wait to do this, and that is where Photo Studio for BlackBerry comes into play. So how many features can you pack into one application? 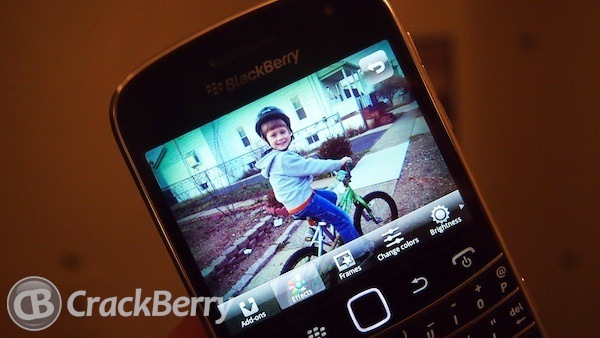 How many changes can you make to a photo right from your BlackBerry device? Let's hit the break and check them out. 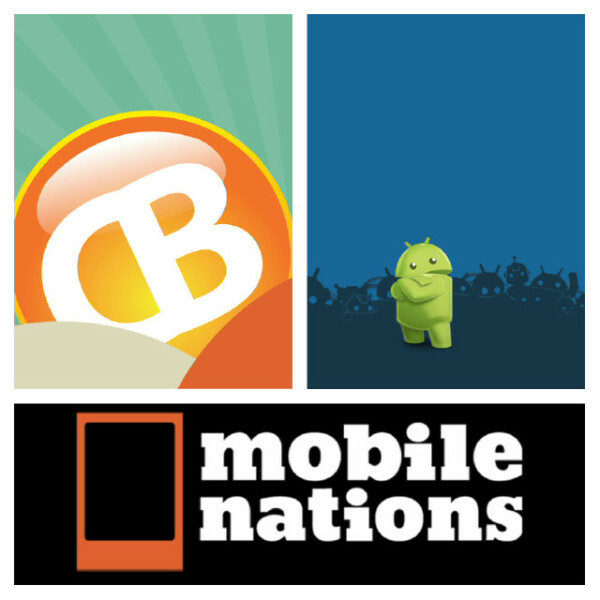 After installing the application onto your BlackBerry Smartphone the first thing you are likely to notice is that the application actually installs three different icons for you. So, why three icons? The first one is a Photo Studio: Camera +, which is basically a shortcut to your camera, with a new icon. The second icon is the Photo Studio: Editor, and this is where the fun edits, and modifications are made. The final icon is Photo Studio: PicFrames, and this allows you to stitch different pictures together, bring multiple images into one and have a little bit of fun with it. 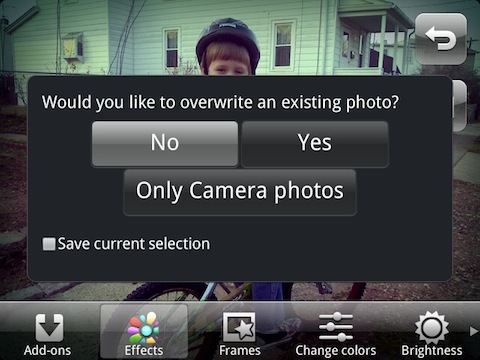 To begin the editing process the Editor application will need to be launched, and from here there is an option to take a new picture or to use one from your existing gallery. Selecting to take a new image will launch the Camera + application that is installed, and from there the image can be captured. If the image comes out the way you want it to be, all you have to do from here to edit that picture would be to tap the rainbow style icon on the right hand side of the screen and it will launch the editor. If you would rather edit an image from the gallery you can simply click on browse and then locate your image on the device. Additionally if you are browsing through your gallery and want to edit an image all you have to do is press menu and then "Edit with Photo Studio". Once you have the image open in the editor you have a few options along the bottom. 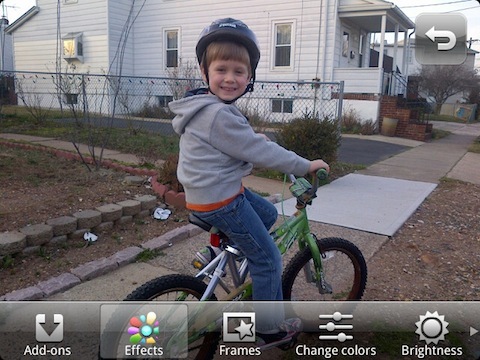 These options include the ability to add effects, frames, change colors, brightness, resize or rotate and a few others. While editing your images you can make multiple changes to the image without needing to save the image each time, so if you want to edit the hue, saturation and colors you can do so without saving and opening the image three different times. Once an affect has been added or any change has been made in the top right hand corner will appear a backwards arrow which allows you to undo what was done, and below it is a check mark which will apply the modification to the image. Once the image is tweaked to just the way it was imagined to look, the image needs to then be saved. Upon clicking to save the image it will ask if you prefer to overwrite the existing photo, clicking yes will replace the original with the edited version, and clicking no will save another image. After this it will ask which size you wish to save the photo as whether it be small, medium, large or the original size. If you are looking to share this with various social networks or just keep it on your device you may want to go with a smaller size, but if you want to print it out you will want the larger sizes. Take note that the larger the file you wish to save, the longer it will take for the image to be saved through the application, and the original size can take a minute or two before it is finished saving. After it is finished saving a menu will pop up allowing the image to easily be shared, opened or even renamed if needed. PicFrame is another part of the main application which allows multiple images to be blended together into one main image. With tons of different frame styles it allows for plenty of different configurations and personalizations, and making these images are rather simple. After selecting the frame that is desired to be used the squares can then be modified to make the size match the photos you wish to use. 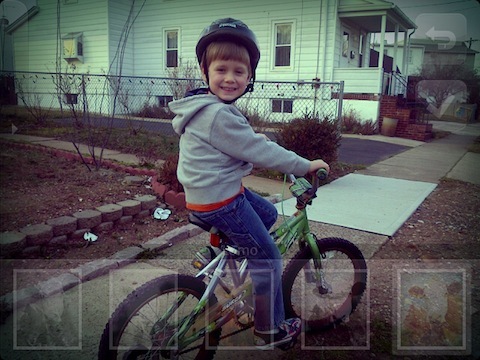 Tapping in the boxes will bring the option to take a new photo or browse the media already on the device. Once the image has been selected the image can be moved around in the box, and it can be zoomed in on as well if needed. After all the boxes are designed the way you prefer the application again allows you to save and share the newly created image with ease. Whether you like to take photos all the time with your BlackBerry camera or you just snap images at random times, Photo Studio is a great option to have installed on any BlackBerry. For those on the edge, and not sure how they will enjoy it there is a free download available, and if you wish to unlock all the pro features it will run you only $3.99. Editing images on the go is very convenient for many users, and Photo Studio allows for a large number of edits to easily be made. You are not limited to filters, which is a huge plus. Unfortunately saving photos can be a time consuming process, especially if there are more than one different edits being applied.